Selontra Rodent Bait is a soft bait formula that delivers fast colony kill of anticoagulant resistant rodents like norway rats, roof rats, and house mice in just seven days. It's shortened bait program requires less bait and it has been formulated with the active ingredient Cholecalciferol, which allows rodents to only eat a small lethal dosage, leaving more for the rest of the colony reducing bait usage and waste. Selontra contains the ingredient Bitrex to help prevent accidental consumption by children and it has the durability to hold up in tough conditions. Use along walls, near gnawed openings or burrows, in corners and concealed places. Store unused product in original container out of reach of children and pets. DO NOT eat, drink, or smoke while using this product. Make applications in areas out of the reach of children, pets, domestic animals, and non-target wildlife, or place bait in tamper-resistant bait stations. Stations must be resistant to destruction by dogs and by children under six years of age and must be used in a manner that prevents such children from reaching into bait compartments and obtaining bait. If bait can be shaken from bait stations when lifted, units must be secured or otherwise immobilized. Stronger bait stations are needed in areas open to hoofed livestock, raccoons, bears, or other potentially destructive animals, or in areas prone to vandalism. Dispose container and unused, spoiled, or unconsumed bait as specified on this label. Bait stations are mandatory for outdoor, above-ground use. Tamper-resistant bait station must be used wherever children, pets, non-target mammals, or birds may have access to the bait placement location. All species not registered for use in California. See footnote for details. This may only be used to control the following pests: House mouse, Norway rat, and Roof rat. Cotton rats*, Eastern harvest mouse*, Golden mouse*, Meadow vole*, Mexican woodrat*, Polynesian rat*, Southern plains woodrat*, and White-throated woodrat*. This may only be used inside and within 100 feet of man-made structures or inside and around/outside of transport vehicles (aircraft, ships, trains, and trucks). In and around docks and port or terminal buildings, public buildings, trash receptacles, transport vehicles (aircraft, ships, trains, and trucks), and alleys. DO NOT use this in sewers. DO NOT place near or inside ventilation duct openings. DO NOT contaminate water, food, feed, food-or-feed handling equipment, milk-or-meat handling equipment, or surfaces that come into direct contact with food. DO NOT sell this in individual containers holding less than 4 pounds of bait. It is illegal to sell soft baits individually. Not registered for use in California on the following species: Cotton rat, Eastern harvest mouse, Golden mouse, Meadow vole, Mexican woodrat, Polynesian rat, Southern plains woodrat, and White-throated woodrat. Determine areas where rats, mice, or meadow voles* will most likely find and consume the bait. These areas typically are along walls, near gnawed openings or burrows, in corners and concealed places, and in other locations where signs of rats, mice, or meadow voles* have been observed. Protect bait from rain and snow. Remove as many alternative food sources as possible to limit competition with the bait. House Mice: Use one wrapped soft bait per placement. Space placements at intervals of 8 to 12 feet in infested areas. Up to 2 soft baits may be used at points of very high house mouse activity. Maintain an uninterrupted supply of fresh bait for at least 15 days or until there no longer are fresh signs that house mice are feeding on the bait. Norway Rats and Roof Rats: Use 2 to 8 wrapped soft baits per placement. Space placements at intervals of 15 to 30 feet in infested areas. Maintain an uninterrupted supply of fresh bait for at least 7 days or until there no longer are fresh signs that Norway rats or roof rats are feeding on the bait. Eastern harvest mice*, Golden mice*, and Meadow voles*: Follow instructions for house mice. Cotton rats*, Mexican woodrats*, Polynesian rats*, Southern plains woodrats*, and White-throated woodrats*: Follow instructions for Norway rats and roof rats. After initial bait placement, ensure an uninterrupted supply of bait is available for 15 days for mice or meadow voles* and 7 days for rats. Replace contaminated or spoiled bait immediately. If bait has been completely removed, replenish placements with 1 or 2 soft baits for mice or meadow voles* and 4 to 8 soft baits for rats. Wearing water proof gloves, collect and dispose of all visible dead rodents and left over bait. Where a continuous source of infestation is present, establish permanent bait stations and monitor them regularly. To discourage infestation, limit sources of food, water, and harborage as much as possible. What is Selontra Rodent Bait? Selontra is a highly effective, innovative rodent bait that quickly controls rodent infestations. It offers several unique advantages for poultry, livestock, residential, commercial and industrial applications, including fast colony kill, shorter baiting regimes, less bait to kill populations, and kills anti-coagulant resistant rodents. What are the advantages of Selontra compared to anticoagulant rodenticides? Selontra's active ingredient, Cholecalciferol, causes rodents to stop feeding on the bait, which allows for shorter baiting regimes and requires less bait to kill populations. Is Selontra registered for use outdoors and indoors? Yes. Applications are permitted indoors and outdoors. Outdoors, Selontra can be used within 100 feet of buildings. It can also be used inside and around/outside of transport vehicles (e.g. aircraft, ships, trains and trucks). Refer to the label for specific outdoor and indoor locations where Selontra may be used, directions for use and limitations. Are than any areas where Selontra cannot be applied? Selontra is not approved for use in agricultural crop fields, sewers or burrows. Broadcast baiting and hand-tossing into suspended ceilings is not allowed. When baiting outdoors, tamper resistant bait stations must be used. Refer to the label for specific application use and limitations. Pre-baiting can be done if necessary, but it is not required. U.S. field trials have shown that Selontra is highly palatable and quickly accepted by rodents. Are than any special baiting protocols I need to follow when applying Selontra? Yes. With a rodent infestation, it is important to avoid under-baiting. When rodent activity is evident, re-apply with a sufficient amount of bait to speed control and to potentially achieve control within seven days. With rodent maintenance, follow label directions. What is the Selontra application rate? How long does Selontra take to work? In rats and mice, consumption of a lethal dose of Selontra causes the affected rodent to stop feeding after approximately 24 hours. Mortality usually occurs within two to four days. Some U.S. Field Trials show mice appearing dead in 24 hours. Selontra can control a rodent infestation in as quickly as seven days. Control is dependent on the size of the infestation and the surrounding environment. What is the container shelf life? We currently have a 12-month container shelf-life. Once applied, how long will the bait remain effective if not consumed? The bait should be replaced after six months. After review of the product and completing the BASF training on this product, I purchased it as soon as it became available. Having a client location suited to conduct my own test so as to ensure palatibilty or acceptance I am satisfied it is as presented by the manufacturer. It will provide an effective level of control while reducing operating costs. I will recommend it as worth trying to any PCP. Will Selontra Rodent Bait cause harm to birds of prey if they eat dead rats that have consumed it? The manufacturer of Selontra Rodent Bait states that there is a low risk of secondary non-target poisoning to birds and mammals. Is there a known antidote for Selontra Rodent Bait? Per the manufacturer of Selontra Rodent Bait , "While there is no antidote, accidental consumption in sub-lethal doses can be treated symptomatically. If consumption occurs, immediately contact a poison control center or doctor for treatment advice." Is Selontra Rodent Bait considered a safer bait? Selontra Rodent Bait is considered a safe bait if it is used according to the product label. This bait contains the ingredient Bitrex to help prevent accidental consumption by children and there is a low risk of secondary non-target poisoning to birds and mammals. Per the manufacturer, while there is no antidote, accidental consumption in sub-lethal doses can be treated symptomatically. Is there a smaller size package of Selontra Rodent Bait for residential usage ? What is the shelf life of this product if not used up? 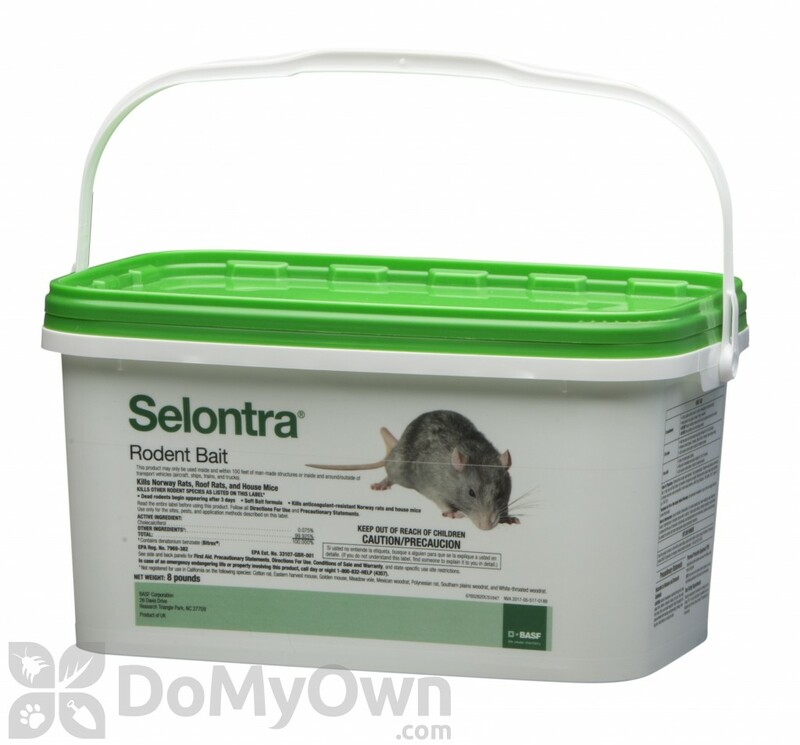 Selontra Rodent Bait currently is only offered in the 8 lb pail size. If unopened and sealed, product should last 1 year if kept away from extreme temperatures. Once opened, best to use product within 3-4 months. Would Selontra Rodent Bait be harmful to my chickens if they eat a rat that died after consuming it?